I am happy to announce that HER DEADLY SECRET is now available in Italian as SEGRETO MORTALE. And the cover is bellissiomo! Drum roll! My third novel, HER DEADLY SECRET, is published as an e-book on July 21st and a paperback on August 10th. On Saturday 23rd September I’ll be at The Hailsham Festival I’d love to see you there. Please come and say hello. Friday 10th November promises a fun evening at Eastbourne’s Underground Theatre where I’ll be chatting to crime writer and perfect interviewer Sheila Bugler in the company of novelists Linda Regan and Cole Moreton. Saturday 11th November is The Eastbourne Book Festival also at the Underground Theatre. I’ll be there too with all three of my books on sale. The blog tour for the publication of Her Deadly Secret was a great success and you can still access the reviews and guest posts by going to the sites on the poster below. Find the links here on my blog page. And more cause for celebration: my short story The Thought of You was shortlisted for the 2017 CWA Margery Allingham award. I’m delighted to say that I’ll be at Bristol Crimefest again this year. I’ll be appearing with the superb writers R.M.Cartmel, Mason Cross, John Gordon Sinclair and Emma Kavanagh on Friday 19th May at 13.40 pm. Our panel is: Cat and Mouse: Playing with your readers and with a title like that it has to be fun! Of course I’ll be around for the whole festival so if you’re there too do come and say hello. My second novel, Her Turn To Cry, is out now in paperback and e-book. I launched the paperback at Hastings Pier Shop. I will be judging the next Flash 500 competition. Closing date September 30th 2016. Rules and details here. Reading at the lovely Needlemakers Cafe in Lewes East Sussex. Another great writing festival with all kinds of writers and readers. Wonderful. My first crime festival experience was wonderful. Read more about it on the blog page. Mindsight is now on sale at the Hastings Tourist Information Office. I couldn’t be happier. And, oh my, look at the neighbours. Hastings’ finest: Robert Tressell and Christopher Foyle! 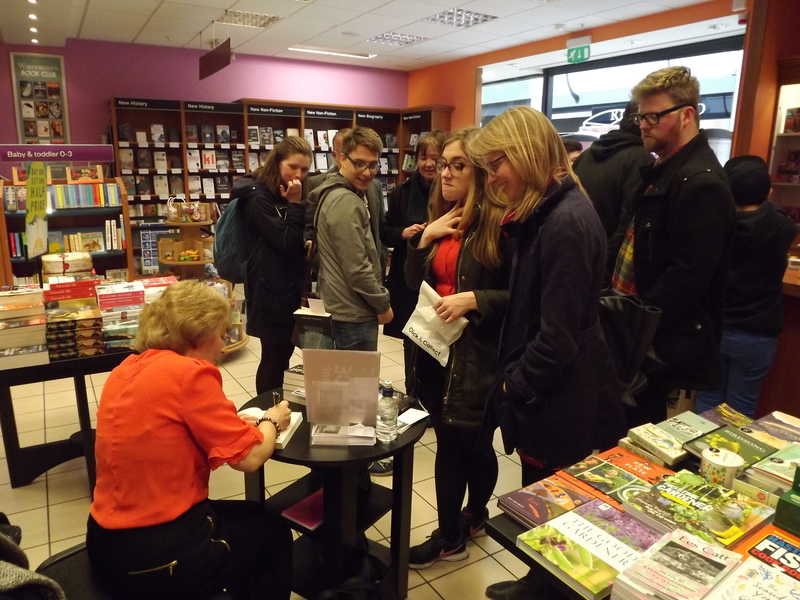 The paperback signing of Mindsight at Waterstones Hastings on May 2nd 2015 was enormous fun. It was wonderfu l after all those lonely hours of writing to have time to chat to book lovers. Readers (and book sellers) are the greatest people. But now I can’t wait to get back to finishing the next novel! 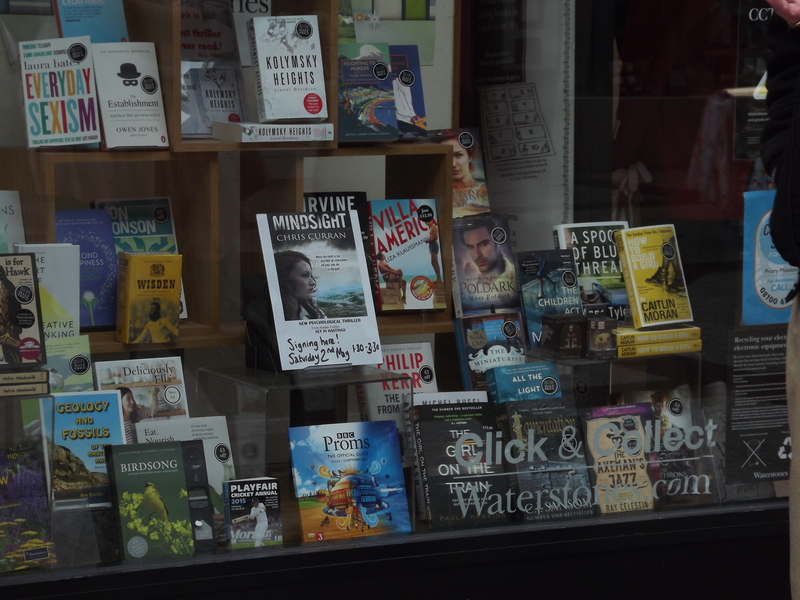 I am thrilled that the paperback of Mindsight is now available and I will be signing books on Saturday May 2nd at Waterstones Priory Meadow in Hastings from 1.30-3pm. All welcome. I was interviewed by Allison Ferns on BBC Radio Sussex about the paperback release in April. My first radio interview. Scary, but enjoyable. And there’s lots of online stuff still available from the wonderful writers who took part.